Let's 'control our borders' by throwing them open! While the majority of the mainstream media have been fixated on the primary task of portraying Jeremy Corbyn as a Russian stooge (in order to deflect attention away from the incredibly incriminating behaviour of the Tory party) the Sky News team have been busy trying to hold the Tory government to account over the absolute shambles they're making of Brexit. First Sky News disclosed that the Tories have taken the extraordinary step of imposing gagging orders on key border operators to prevent them disclosing what the government are plotting. Thinking back to the EU referendum debate and all the talk of "taking back control", this rhetoric hardly seems compatible with highly secretive government plotting and their efforts to gag private and public border agencies to prevent them from warning the public what they actually have in store for us. Surely nobody figured that "taking back control" actually meant handing even more control to the Tory government to wilfully hide their schemes from the public, their political opponents, and British businesses alike? Then the Sky News team delved into the details of what the Tory government have been so desperate to hide. 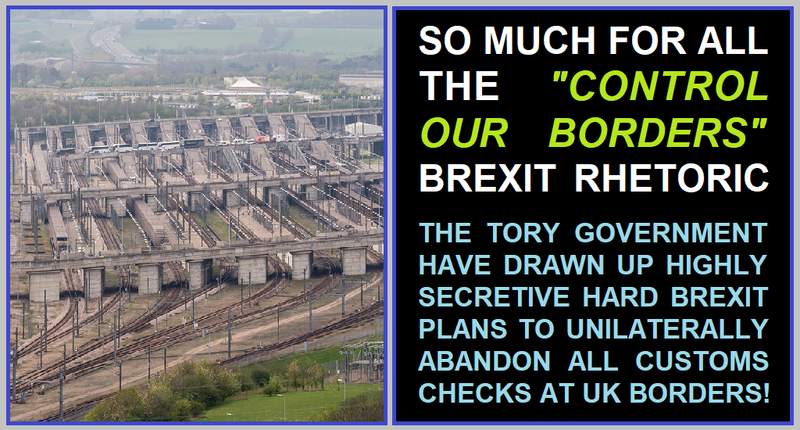 Apparently the scheming Tories have drawn up three different Brexit scenarios to test out on the various public and private border operators which have been labelled "hard Brexit", "Soft Brexit" and "No deal". Under the "no deal" scenario the Tories have decided that the only way to deal with the border issues is to throw the UK border open completely, and unilaterally abandon customs checks! This "throw open the borders" option is quite extraordinary given that "controlling our borders" was such an elemental part of Leave propaganda that delivered the Brexit vote, and was quickly adopted by the Tory government as one of the narratives they used to attract the hard-right ultranationalist blue-kip demographic who were fleeing the wreckage of UKIP. The reason the Tories have decided to model this extraordinary "open borders" approach to Brexit is obvious. If they had any intention whatever of securing our borders, they would have had to have invested £billions in new customs checking facilities, infrastructure, software, and staff, but they've done nothing to address this enormous challenge for the best part of two years. We now know that the Cameron government didn't bother to do the slightest amount of contingency planning just in case they lost the Brexit referendum, and that the Tory cabinet are still bitterly divided over the actual objective of Brexit almost a full year after Theresa May triggered Article 50. 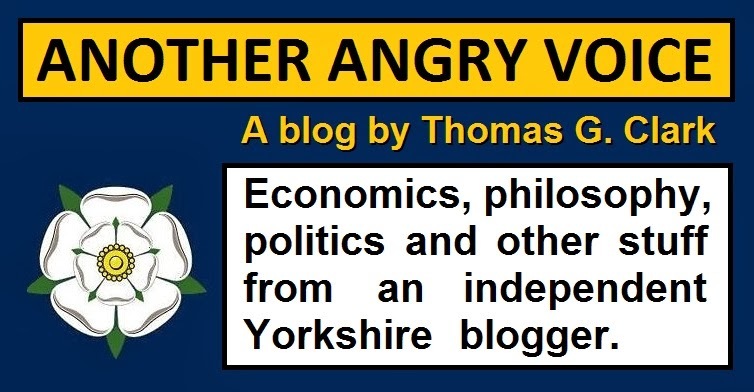 All in all it's hardly surprising that giving the Tories the green light to just make it up as they go along is resulting in such abject chaos. The EU have no intention of throwing open their borders if no customs deal can be agreed before Brexit actually goes ahead, meaning that Britain's decision to throw open our borders would be a unilateral one. Many on the Tory right conceive post-Brexit Britain as a kind of backdoor into Europe for substandard produce (like chlorinated chicken or hormone riddled beef), but the EU have no intention of letting that happen. Even if it means huge delays for British exports to the continent while they build the infrastructure to carry out the customs checks, the EU simply aren't going to allow the UK to act as a backdoor conduit for unscrupulous profiteers to flood the European market with substandard produce. So in this farcical Tory Brexit scenario "taking back control" equates to allowing the government to make it up as they go along behind closed doors, and "controlling our borders" equates to throwing our borders open because the Tories have done absolutely nothing to build the customs infrastructure necessary to actually check what's coming in! Given that this "throw open the borders" approach is the polar opposite of what Leave voters were promised during the debate, you would have thought that more of them would be spitting blood about it, but then this kind of analysis relies on a fundamental misunderstanding that a lot of Remainers still seem unable to get their heads around. The misunderstanding is the idea that people who were duped into supporting this chaotic hard-right "let's make it up as we go along" Brexit can be convinced to change their minds with facts, evidence, analysis and the like. They can't be convinced to change their minds through appeals to reason because Brexit was an emotive decision for them, so it doesn't matter how much we point out stuff like the way "control our borders" has morphed into "throw open our borders", they'll simply perform cognitive gymnastics to pretend that they knew that throwing open the borders was the plan all along, and that's what they voted for. The terrifying thing is that it doesn't matter how much chaos, division, economic damage Brexit delivers, nor how many promises are broken, businesses are destroyed, jobs are lost, or families are thrown into poverty. millions of Brexit voters will continue to insist that that's exactly what they voted for. It's clear that to a lot of people unleashing such chaos and destruction on your country and your fellow citizens is a price worth paying in order to avoid admitting that you were wrong.